USB Modem allows you to use Treo 600, Treo 650 and Treo 700p smartphones as a USB modem for connecting a desktop or notebook computer to Internet. To surf the Internet from your PC you will need only a USB cable and a Treo with GPRS/EDGE service or CDMA 1x/EvDO data plan. I couldn’t get the Bluetooth connectivity option to work. The USB connection option seems to do the trick however. I’m now able to use my phone now exactly as I wanted to without paying the extra EVDO connection fees (hopefully). Also, I found a bug where if you have Menu Meters installed and the Bluetooth indicator in the menubar as well Menu Meters keeps on restarting while you are connected. If you turn off display of the Bluetooth icon then everything is fine. Hopefully this won’t get shut down, since it basically enables exactly what you want — internet access on your laptop (in my case a Mac OS X G4 Powerbook) using EVDO speeds. First, download the trial of the USB Modem software to make sure this will all work for you. Follow the User Guide instructions to configure your laptop, and install the USB Modem .prc onto your Treo 700p. Go to Prefs, click on Networking. Make sure that you are currently disconnected. Otherwise the USB modem won’t work. Click the Enable Modem Mode button. Leave the Connectivity method set to USB, and the Background mode set to checked. 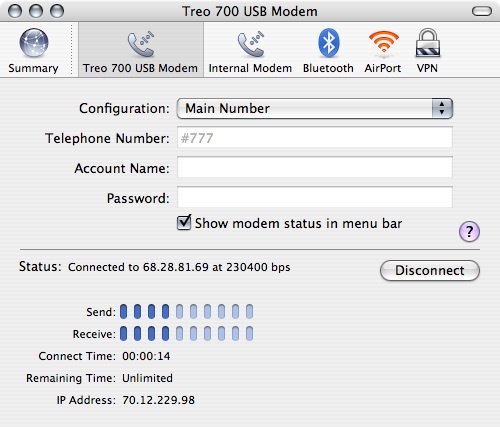 Under OS X, open Internet Connect application, and select the Treo 700 USB Modem option. You should see #777 in the Telphone Number, leave everything else blank. You should see it saying Contacting PPP Server… then Authenticating, then Connected. When you’re done using the internet, click Disconnect in Internet Connect, then click the Disable Modem Mode in USB Modem. If you don’t do this, the next time you try to sync using the USB cable you will get an error message stating that the connection is already in use. Enjoy super-fast EVDO speeds on your laptop wherever you go…!!! I did find that occasionally you will need to turn the phone off and then back on again to reset the internal networking features after you’ve used it as a modem. I purchased the software since it seems like exactly what I need, and I’d encourage you to do the same. Also, I haven’t gotten my first bill with the new phone yet, so I’m not 100% certain that there won’t still be a charge for using the phone as a modem. But you may as well give it a shot. I’ll update this post if I see anything on my next bill — I don’t expect to be using the phone as a modem all the time since I’m usually in the vicinity of a WiFi connection. Update 1: I haven’t seen any additional charges on my bill, so this looks like a pretty great solution. Update 2: Warning: please see comment #23 below for a problem that David had with this where it “fried” his hard drive. I’m not sure exactly what happened, but please use caution when following these instructions. I haven’t had any problems with it at all, but you may want to backup your hard drive before you proceed. Vision/Power Vision: Services are not available with all Sprint phones. Usage is calculated on a per kilobyte basis and is rounded up to the next whole kilobyte. Rounding occurs at the end of each session or each clock hour and, at which time we deduct accumulated usage from your plan, or assess overage or casual usage charges. You are responsible for all data activity from and to your phone, regardless of who initiates the activity. Estimates of data usage will vary from actual use. Your invoice will not separately identify the number of kilobytes attributable to your use of specific sites, sessions or services used. Premium content (games, ringers, etc.) priced separately. Services are not available for use in connection with server devices or host computer applications, other systems that drive continuous heavy traffic or data sessions, or as substitutes for private lines or frame relay connections. Except with phone-as-modem plans, you may not use a phone (including a Bluetooth phone) on a plan with unlimited Vision/Power Vision as a modem in connection with a computer, PDA, or similar device. We reserve the right to deny or terminate service without notice for any misuse. Availability of downloadable or streaming content is subject to change. You can read my response below, but basically I think they’re shooting themselves in the foot here. I haven’t heard anything from them about this, and probably they’ll only use that T&C to address specific problem usage (for them) where they have a customer using too much of their “unlimited” data plan. I don’t think it’s a real great strategy to tell some of your most fanatical customers and fans that they are basically screwed. Because heres the thing: we have options, some great ones. It’s probably time to look at shopping for a different carrier if you care about regular computer usage without having to pay their extortionate fees for using your computer with this phone as a modem. This entry was posted on Friday, June 2nd, 2006 at 10:17 pm	and is filed under How To, Palm, Phone, Tools, Treo 700p. You can follow any responses to this entry through the RSS 2.0 feed. You can leave a response, or trackback from your own site. @ Howard – My monthly usage is pretty low (data plan usage for basically all of January is “370777” (does this mean 370K transferred?)). I basically use this only when traveling or for emergencies since everywhere else I get WiFi easily. I haven’t seen any additional charges related to data usage. My bill still says “unlimited” for data plan. My monthly charges for the last 12 have typically been between $140-$200 per month (none of it for data that I can tell). @Ben – When I wrote this how-to, that was NOT what their terms and conditions stated. As they say, however, they reserve the right to change those terms and conditions at any time. I suspect their change is due to people figuring out ways to get around their very high prices for something that many people thought they were getting included in the base price of their plan. That being said, everyone needs to decide what it’s worth to them to use this workaround, and would be advised to look at these revised terms and conditions and think about what they want to do. @hj – I am not a lawyer, but I don’t think that anyone should be going to jail for breaking terms of conditions that they didn’t read or specifically agree to. I’ve been a loyal customer for Sprint for over 7 years. My “Sprint Subscriber Agreement” expired on 12/10/2005. If they want me to switch to another carrier over me not wanting to pay them an ADDITIONAL $39 per month, I would be sad, but there are other options. Here is what would happen: Bye bye Sprint (and, sadly, Treo), hello iPhone! The policy of always reserving the right to change the rules of the game (terms and conditions) is basically a way to say, “We always reserve the right to change what you’ve agreed to.” In other words, we reserve the right to screw you at any point in the future if we figure out a way to do so that will make us more money. In my opinion it should be illegal to include this provision in a contract. I can understand the argument they might make about needing to update agreements if their capabilities change, but using that provision to LESSEN what your customers can do compared to what they thought they BOUGHT is wrong. I guarantee that the T&C that I agreed to were NOT the ones listed now (last time I read them they weren’t Nextel/Sprint, they were just Sprint). So, make up your mind about how you feel about this, and what you’re going to do about it. I don’t think Sprint would actually care at all if everyone who used this workaround became not their customers. Businesses have no soul. They don’t care about people, only ultimate bottom line profitability. Now, if a lot of people called them out about publicly about their ridiculous change to their terms and conditions (basically changing their mind about what it it we’ve bought) maybe that would change something, but I don’t know. It would be very easy right now for Sprint to shoot themselves in the foot with this issue. Screwing your valuable, loyal, long term customers who will tell all their friends about their experiences over isn’t a really good business strategy in my opinion. Probably if you keep your data usage to a minimum you can stay below the radar. I suspect, though, that they probably do have the capability to detect any non-phone authorized usage, and could probably ding you if they wanted to. All I can say is, given this recent change to the terms and conditions, if data access using your computer is important to you, it’s proably time to start shopping around for a new provider. Sprint has decided to make it not a safe choice anymore to use their service in the way that we wanted to use it. Hopefully they will see the light on this issue and change their policy. Saying that we can use “unlimited” amounts of data on the phone but as soon as we want to use a single byte of data using our computer then we need to pay extortionate amounts doesn’t make any sense. Data is data. I say, either give us what you promised when we signed up or or lose us as customers. TREO 700p with MBP running OS X 10.5.4. I’m entering this post using it! Can someone help??? I am getting “Modem removed-Unavailable Device”…Anyone know what this means? What do you put for username and password? is this your phone number? Please advise!!! Sprint changed the ability to use the USB Modem software? Any help or suggestions would be appreciated.